The Force M9 wireless laser mouse is a gaming mouse launched by the industry giant Gigabyte. 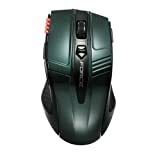 The highly efficient mouse is designed to work on almost every surface smoothly. The Force M9 follows in a wired version called the Force M7. The mouse has satin silver-gray accent pieces on each of its flanks that break the dark color scheme and give it a stunning look. Within the accent pieces, the rubber grips are set. On the front of the mouse and the left-side accent piece are four red LEDs that indicate the current DPI setting. The lights only light up when the DPI is adjusted so that the user is not distracted. Just behind the quartet of these LEDs are two thumb buttons. The front button is a page forward button, while the rear is the page backward button. No matter what browser is currently active, these buttons work the same. Gigabyte has used an ergonomic design for the mouse, which features slight alcoves in the right and left sides of the mouse to allow right-handers to grip it effectively. These alcoves are lined with rubber pads that further enhance the grip. The Force M9 laser mouse wheel has a refined clicking action that makes it very convenient to scroll through a list accurately. The two well-positioned buttons on the right and left sides are very responsive and suitable for an average-sized hand. At the back of the mouse wheel, there is a four-stage DPI switch that allows you to alter the sensitivity of the device. The Gigabyte wireless mouse includes a tiny USB dongle that makes it ideal for use with a laptop on the move. It can be stored in the bottom of the device when not in use so that you are less likely to lose it. Also on the back is a battery compartment that accommodates two AA batteries. The most interesting thing about the Gigabyte Force M9 ICE wireless laser mouse is that it can be used on a glass desk without any tracking issues and can glide smoothly on the glass due to the ICE technology laser sensor emitter. In fact, the technology enables the mouse to work on almost every surface without the need for a mouse pad, giving you extra freedom of motion. It performs great on a crystal clear surface like glass and ice. The Force M9 wireless device is equipped with the Gigabyte Free-Scrolling Technology, which can allow you to browse web pages and files more effortlessly. It is equipped with the company’s latest power-saving technology due to which the device is capable of lasting up to two years on batteries. Changing batteries will be very rare when using this device. The Gigabyte Force M9 ICE wireless laser mouse has excellent ergonomics, styling, and aesthetics. Its best aspects are that it comes with batteries and has an on-the-fly DPI switching. The device can work on any surface smoothly and effortlessly.